The fit of these parts is not great. Careful sanding and alignment must be undertaken to get a good fitment of these sections. Using the recommendation to drill into the front and back halves to get better structural support is a good one, but you really need to be “spot-on” with your drilling technique, otherwise you will just end up with “shifted sections” when they come together. I ended up having to “negotiate” the alignment of these holes myself, but once in good form, I used a clamp to hold the sections in alignment while the ACC set. Then, I used filler to close up the seams and sanded them smooth. 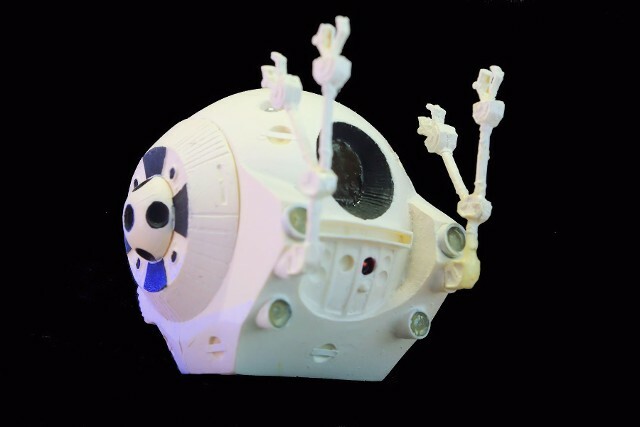 The “claws” of the pod are another issue. They are thin resin castings, loaded with flashing that needs to be cleaned, and they are brittle. Great care needs to be taken to prevent breakage. 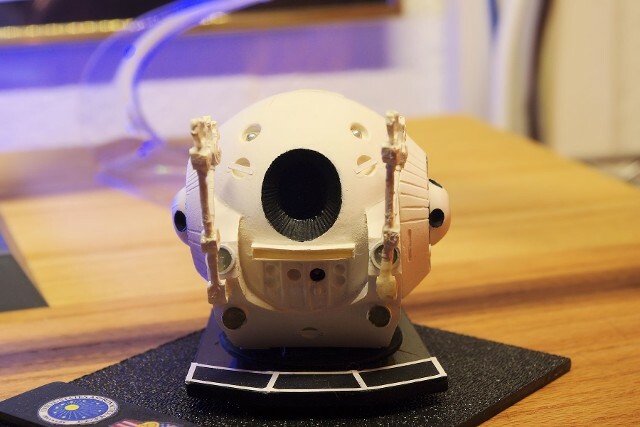 Fixing them onto the pod seems to be best accomplished by drilling a pilot hole into the claw base and the location on the pod face, and using a section of straight pin to support he claws while the epoxy cures. Once these trials are overcome, and the painting and detailing begin, the kit is really quite nice looking. I used still from the movie and some pod graphics found on the Web to complete the detailing of the door area, including a homemade set of “Caution – Explosive Bolts” markings made from Avery clear inkjet material and scaled from the web-based graphics. Thanks to Dave Larson for posting his rendering of this marking onhttp://pod.Paragrafix.com/general/ext_misc.HTML. The rest of the bolt detailing was done with small sections of red striping tape and white paint dots. The Paragraphs site is a treasure-trove of other Pod detail data. 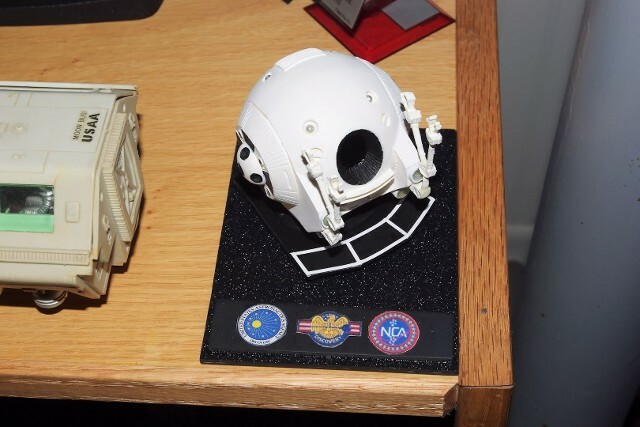 I then fabricated a display base from 1/8 inch thick black ABS sheet, with a rendering of the Pod Support base from the Discovery Pod Bay, and a set of three patches from the movie space suits. 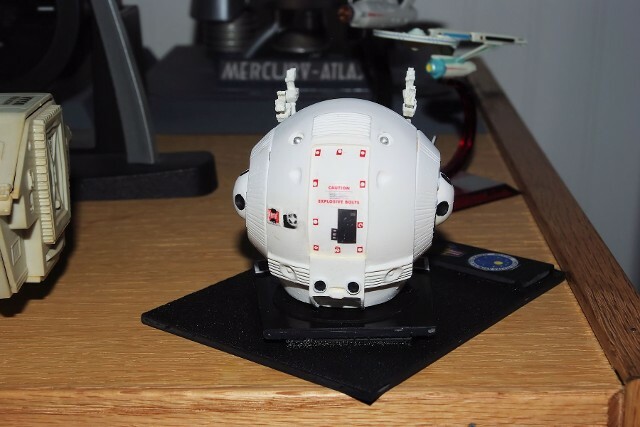 While not as grandiose as the Atomic City versions, the little C & R model is a nice piece at an affordable price, and good quality casting worthy of any 2001 model collection. 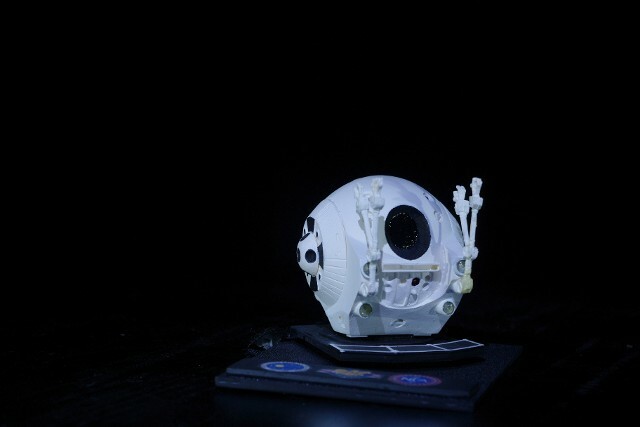 Like a lot of things here at the SpacePort, this little C&M Model was not the "last word" in the 2001 EVA Pod story. 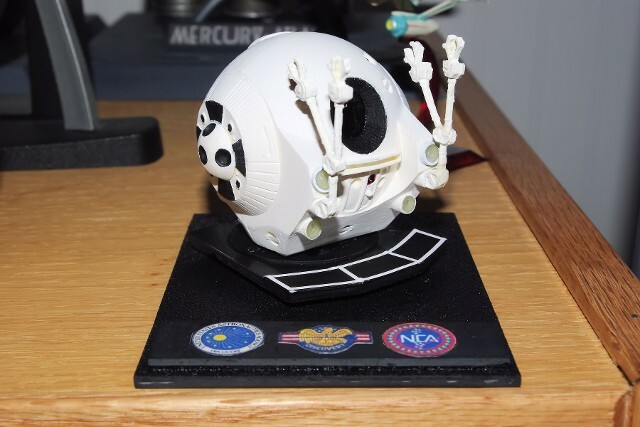 In late 2018, Moebius Models announced another "50th anniversary" celebration model release that would not happen during 2018. The stage was set for the release of the 1/8 scale (!) 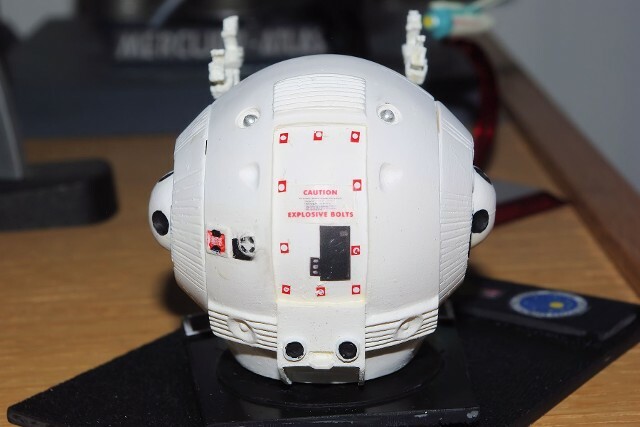 EVA Pod Model from Moebius. We waited on CultTVMan's pre-order list until March of 2019, when the word was given - release shipments are arriving. Confirm your order now. We did.